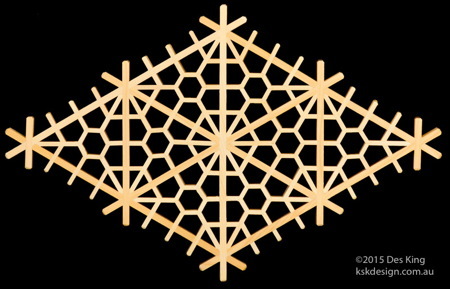 This is one of the more complex patterns that will be included in Book 3 — the yae-karahana kikkō. 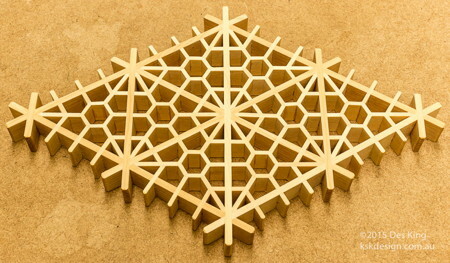 It is closely related to the previous karahana kikkō pattern. The following photos show the process I followed in putting it together. I don't explain how to make the pattern — you'll have to wait for Book 3 to be published for that — but the photos will give you an idea of what's involved in making a pattern such as this. As with all the patterns in all of my books, the yae-karahana kikkō was made without using any specialised tools; just the normal tools I detailed in Books 1 and 2. 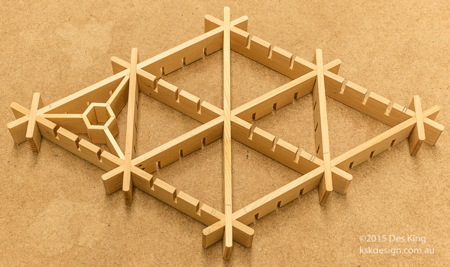 First, I cut the three-way mitsu-kude joints in the jigumi, then the three half-lap joints between each of the mitsu-kude joints. I then cut the jigumi pieces to length, and chamfered the ends. Two of the Type A pieces will be further trimmed, but it's more efficient to cut all the pieces together. Next, I assembled the jigumi. After which it was time to make up the hexagons. 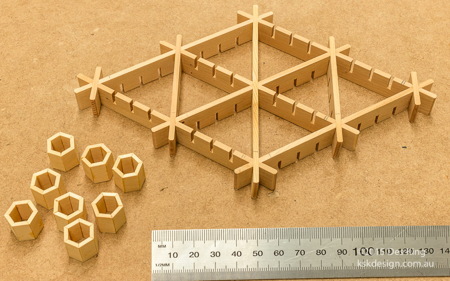 Eight hexagons are required, and each hexagon side is 7.5mm. The following photo will give you an idea of the size of the piece. 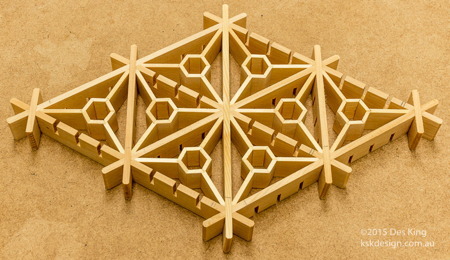 The hexagons are secured in place by three longer locking pieces extending from the corners of the triangles. 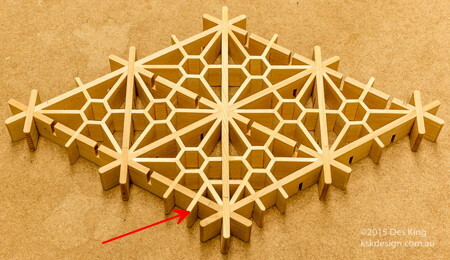 Jaguchi joints are used to hold the hexagons firmly. All the triangles have to be filled in. Next, I started on the smaller locking pieces that intersect the outer jigumi pieces (red arrow below). 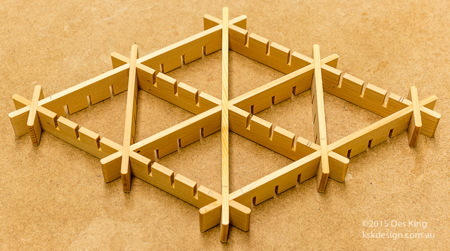 These also use jaguchi joints to lock the hexagons. All these pieces have to be inserted before I can move on to the next step. The next pieces to insert are the smaller internal locking pieces (red arrow below). These have jaguchi joints at both ends, so any adjustment is quite difficult. 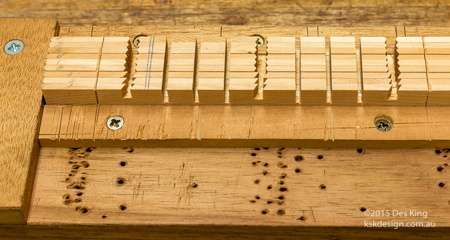 The half-lap joint has to be in the exact centre between the jaguchi joints, so in this pattern, these are by far the most difficult pieces to cut and insert. 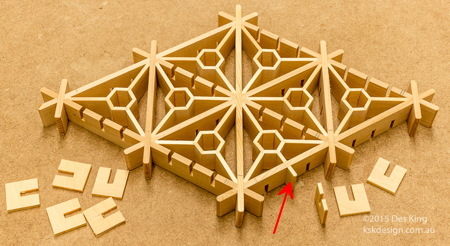 The final pieces to insert are the second hexagonal pieces (red arrow below). These are trimmed to fit on the 60° jig. 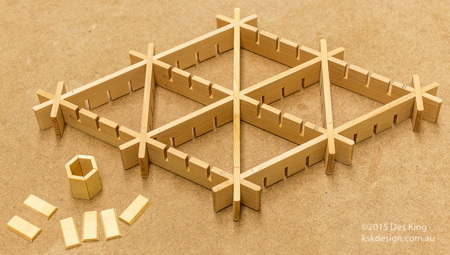 These are not particularly difficult, but the sheer number of pieces make this final process quite time-consuming. 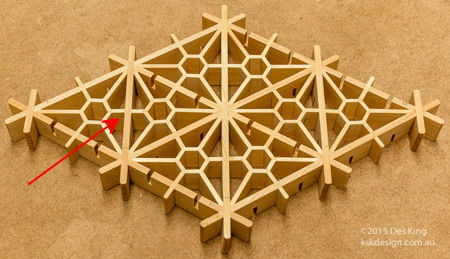 Once these final hexagonal pieces have been inserted, the pattern is completed. And that is how I made the yae-karahana kikkō. 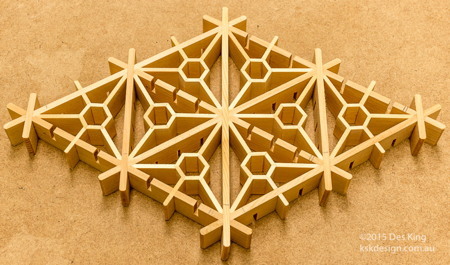 Most of the more complex kumiko patterns at first seem to be a confusing maze of pieces of wood heading off in all directions and angles, but if you can break the patterns down into their individual pieces within each of the triangles, they do have a much more structured feel about them.